When I was growing up, my mom and my grandma always made Valentine's Day a family holiday. I remember receiving little trinkets and cards from the time I was small. Valentine's Day was always a time to say I love you, a time to think of the people who are special in our lives. I'm continuing that tradition with Grace. Valentine's Day is a time to appreciate each other. Joe and I will celebrate our love for each other, certainly, but also our love for our daughter. I was feeling stuck for a way to celebrate Valentine's Day with Grace this year. I didn't want to give her candy. She already eats too much candy and junk food. I am eliminating it all together from our home. Aside from that, I don't want to encourage Grace to grow up associating food with love. I didn't want to give her a bunch of stuff, either. Believe me when I say that we are drowning in stuff. Drowning. We have more toys than a family with five children could use. So… I wasn't sure how to celebrate a holiday without food or presents. 2010 is seeing more changes in my life than I ever imagined. I brainstormed and brainstormed. I had nothing. So Grace and I went shopping. Don't judge me. I do some of my best thinking while over spending. We found this little mailbox. Grace pointed it out to me from across the craft store, and I had an idea. Grace is just beginning to understand the concept of mail. Grace likes mailboxes, in general. A few months ago, we made a play mailbox out of a big cardboard box, and she still plays with it often. She even delivers her pretend mail to people when they come over. I picked up some pretty double-sided scrapbook papers, lots of foam and regular stickers, and a lot of other irrelevant supplies, and we headed for home. I made Grace mail. I made 14 fancy little envelopes and numbered them from 1 to 14 (like an advent calendar, but counting the days until Valentine's Day instead). When I'm finished, each will contain a little love note from Joe and me to Gracie Anna. The envelopes took an incredible amount of time. As I was working on them, I was thinking that I would be able to re-use them for years to come. Presuming Grace doesn't mangle them, that is still my plan. First, I printed the envelope template on heavy duty (but cheap) card stock at 50%, 75%, and full size. I thought the 50% was too small, and the full size wouldn't fit into the mailbox. 75% worked nicely. I used the template to trace 15 of my envelopes. I planned for an extra one in case something went awry. It did, so I'm glad I had an extra. I used an ultra fine point Sharpie to trace around my template. I would have rather used pencil, but I couldn't find one. On the first page, I traced 3 envelopes. I was really proud of myself; I'd be able to squeeze all 15 envelopes onto 5 sheets of paper. Then I realized that the patterns were all directional. They would have looked silly if I didn't have them straight up and down on the envelopes. Would Grace have noticed? No. But I would have, and I wouldn't have been happy with the finished product. On the subsequent papers, I looked at what the finished envelope would look like, and I traced the pattern as it needed to be. Most of the papers ended up with only 2 envelopes. 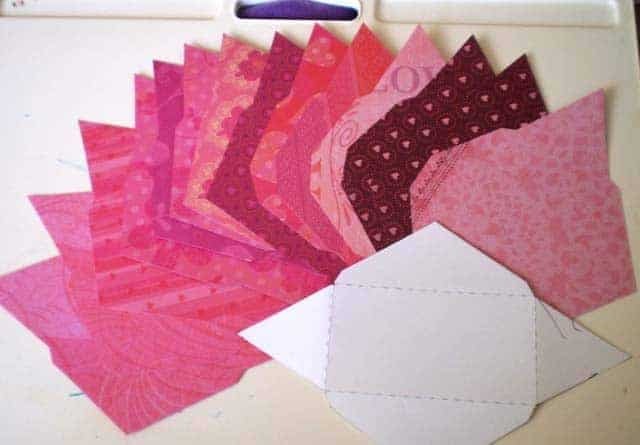 One had only 1 envelope (right in the center), and a couple had 3 envelopes. Next, I cut out the envelopes. I thought this would be the easy part. I was very wrong. Actually, it wasn't that hard. The inside turns were a little tricky, and I was using scissors. It would have been easier to cut them with a craft knife, but I'm not so good at using one. Oh, and Grace was sleeping on my lap the entire time I was working, so it would not have been prudent. I noticed quickly that cutting on the line wouldn't work. The edges of every envelope would have been black. Instead, I had to cut just inside the lines. 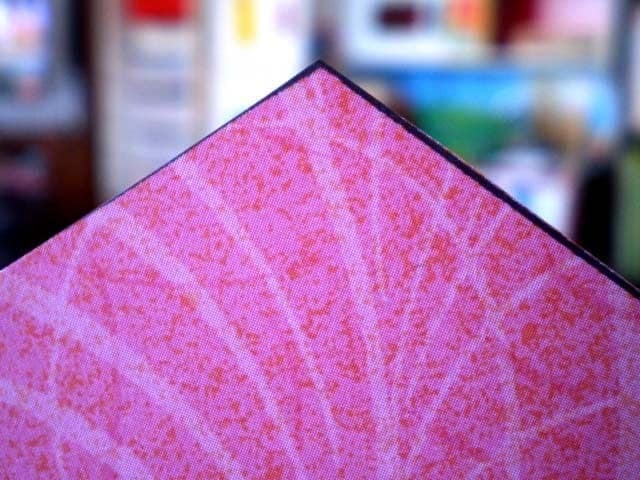 I used the only straight edge within my reach (an embossing folder for my Cuttlebug machine) to score all 4 fold lines on each of the 15 envelopes. As I was folding and creasing the envelopes, I used a little adhesive to stick the bottom flap to the side flaps. After I'd creased a couple of the envelopes, I wished I hadn't. The card stock paper cracked a little in some places. That's why I tossed one of the envelopes; it was cracked badly on all four edges, and it just didn't look nice. Aside from that one, I thought the envelopes were gorgeous. I decided that I should number the envelopes, and I just happened to have a huge container of Valentine's Day foam stickers that Grace picked out. They are all dog-themed, and the paw prints would make a nice date medallion on the front of each envelope. I thought the paw prints were a little too plain by themselves, so I dissected them and switched the colors around. I thought they looked great. By this time, Grace was awake, and she asked me why I messed up all of the paw prints. Thwack! That was the sound of my ego hitting the floor. I spent an hour taking paw prints apart and putting them back together for to celebrate my love for this beautiful child, and she said I messed them up. I liked the paw prints with contrasting accents, and it's my project, so I left them that way. I put the envelopes and paw prints in the order that I liked them. I stuck one of the paw prints to each envelope. In most cases, I put it on in the center of the plain side. On envelopes where the sticker would have obscured the design on the envelope, I put it somewhere else. Next, I numbered the envelopes in order from 1 to 14. The next-to-last step was to make my little notes. I measured the envelopes, and I cut a card template that would fit inside comfortably. I chose plain card stock in pink and purple, Grace's favorite colors. I backed each note with a small square of patterned paper that I know Grace likes, and I put a sticker related to the note in the center of this paper. You are the best kid in the whole wide world! Mommy and Daddy are so proud of you, every single day! Mommy and Daddy are glad that you are our daughter. You are very kind and generous. You have the best manners, and you always use them. Mommy and Daddy can't wait to see you after school every day! We love it when you help out in the kitchen. We are so proud of you for using the potty! We love hugs and kisses from you! You are going to do great things in your life! Mommy and Daddy love playing with you! The very last step was to put the notes into the envelopes. I haven't assembled all of the notes yet (because it took a lot longer than I expected to make the envelopes), but I intend to put stickers in some and coupons for special activities in others. For February 1, I tucked some little heart stickers inside the envelope. In the days to come, I intend to have more stickers, coupons for fun activities like a trip to the park or ice skating, or maybe Chuck E Cheese. 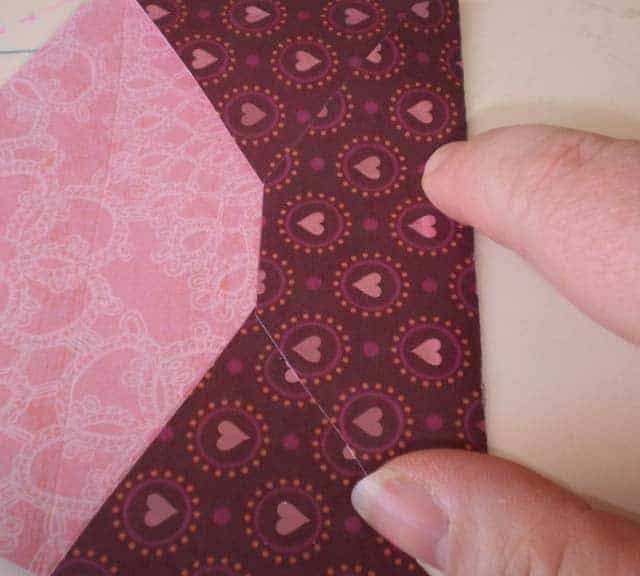 Once in the middle and on Valentine's Day, Grace's envelope will have a clue to the location of a special (small) present. I picked up a couple of Crayola Color Wonder packs that I think she'll like. I'm not sure whether I'm going to make them a single gift or two separate gifts. I put the envelope into Grace's little mailbox, rigged the mailbox with a couple of foam stickers to hold the flag in place, and put it in a conspicuous spot where Grace will see it first thing in the morning. I can't wait to see the look on Grace's face tomorrow when she sees her mailbox and the little letter inside. I'll let you know how it turns out. What a great idea! I saw Target had these in the dollar aisle. I’ll need to run over there while the kids at at school to get started on this! LOVE IT! You’re so creative!!! I love this idea! I've thought for a long time about a way I can write notes to the kids because I know it would mean a lot to them. The mailbox idea is perfect! What an awesome project! You spent so much time making those beautiful! My children would absolutely love this. Excellent idea. You are so crafty. I may have to go to Michael’s today, but I think I’ll just buy some cute stationary as I’m not great at crafts, and those envelopes look out of my league. Honestly, if I'd seen envelopes that were small enough, I may have gotten them. I didn't, so I made my own. 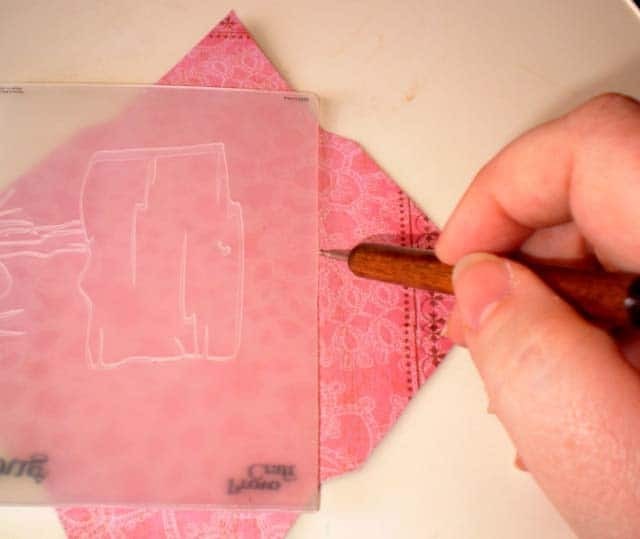 It really is as easy as tracing the template, cutting it out, and folding up the flaps. So thoughtful and darling! Hopefully, you'll get to save them and use them next year, too. What a sweet idea! She is a lucky little girl! I am blown away by the idea and how beautifully you executed it!! I would love to do something like this with my own daughters. Thanks for sharing! This is the sweetest little thing, and I’m sure Grace is going to really enjoy getting her Valentine mail every day! Thanks! I hope they'll be able to use it! This is a wonderful idea for love notes and I think anyone of any age would appreicate this little mailbox. Thanks for sharing your idea…come say hi sometime! You're right. If I had a little more time and energy, I would do the same thing for Joe. These are perfect for the upcoming Valentines parties. I wish you’d come join my link party at childmade.com. Thanks for sharing!! i love this idea…and i am going to do it. maybe not with mailboxes bc i have too many girlies, but i love it! Definitely! You can adjust it to fit your family. Maybe you could put out one mailbox and put everyone's mail in the same box? OMGosh!! SUPER cute idea!! They have those mailboxes in the dollar section of Target and I had no idea what to do with them. I wish I read this post sooner. I could still count down the last 7 days and next year do 14. Thanks!! (One year I wrote a poem for each of the girls and one for my husnband) One year I made a collage for each of them- you know old school – cut out papers from mags, pictures, words, sayings, etc. I love doing the non candy thing. And we have way more stuff than we need. I agree with you on those points! Thanks for the great tut. I think you might have a little crafter in the family…. Great idea. Thanks for joining “Get your Craft on Thurs.” I hope to see you next week. Awwwwwwwwwwwwwww. This is such a wonderful idea! LOVE it 🙂 We have to make Kaishon's valentines for his classmates this week!